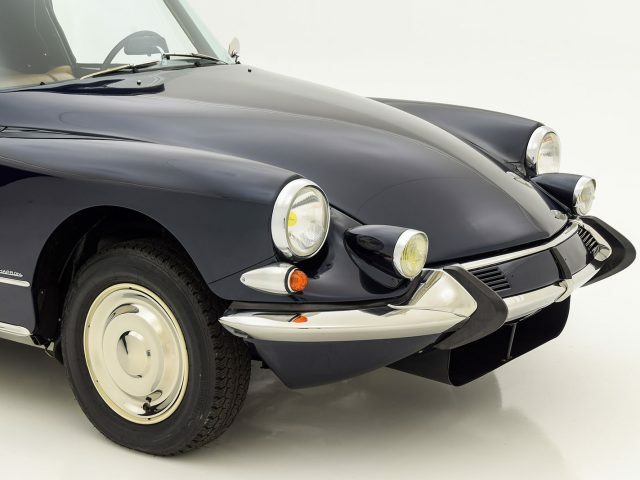 Perhaps the most incredible aspect of the DS was that it was not a styling exercise or a low-production halo car, rather, it was intended for general consumption and built in surprisingly large numbers. 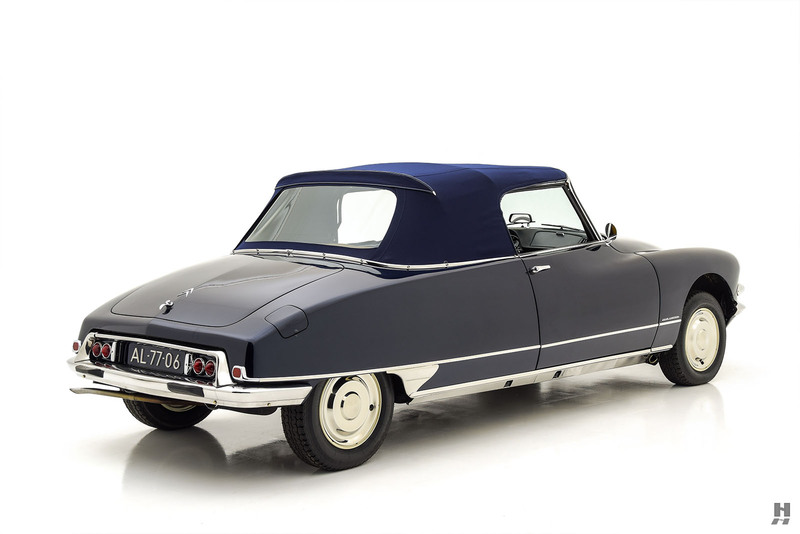 Citroen produced more than 1.4 million examples in the car’s incredible twenty-year run. 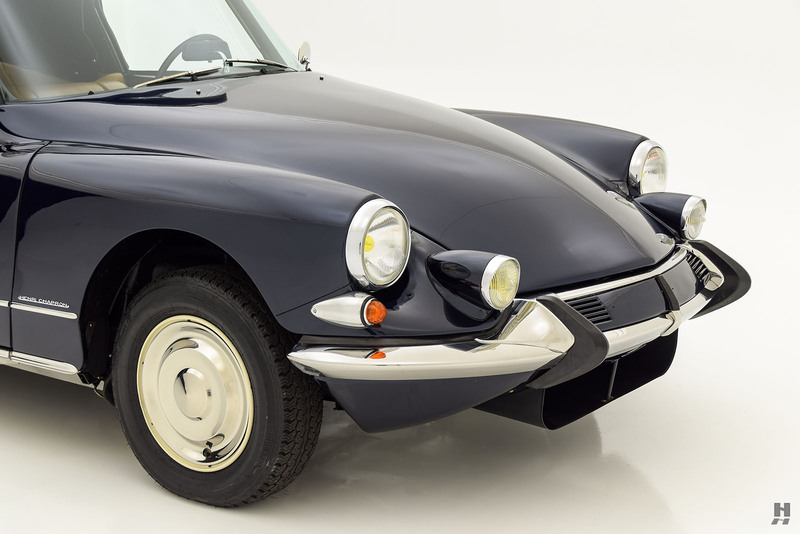 Throughout production, Citroen offered several variants of the car, including the standard DS sedan, the stripped down and simplified ID, and the cavernous Safari wagon. 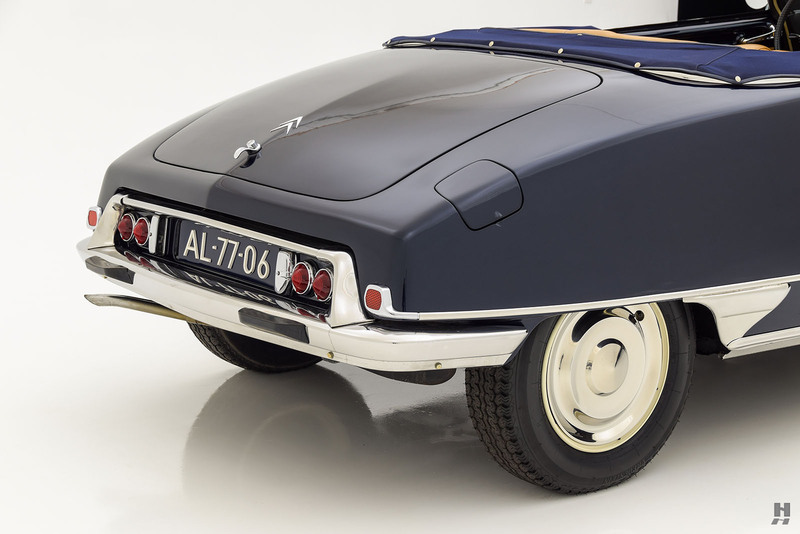 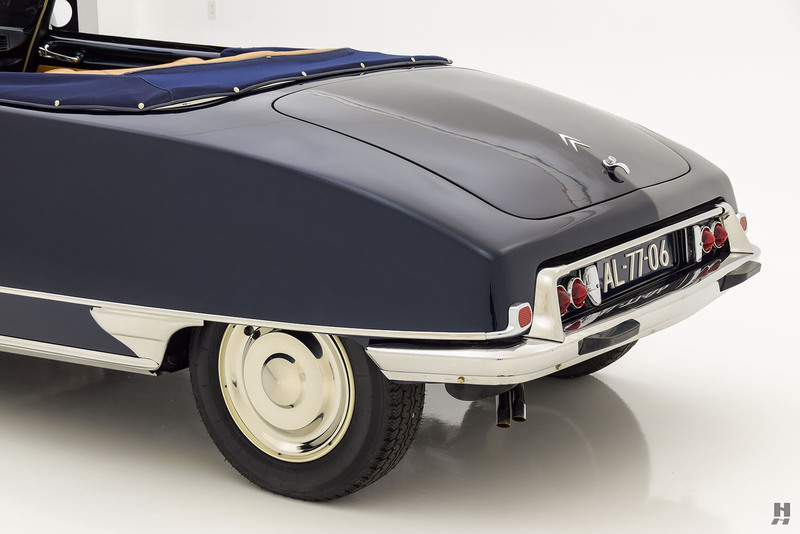 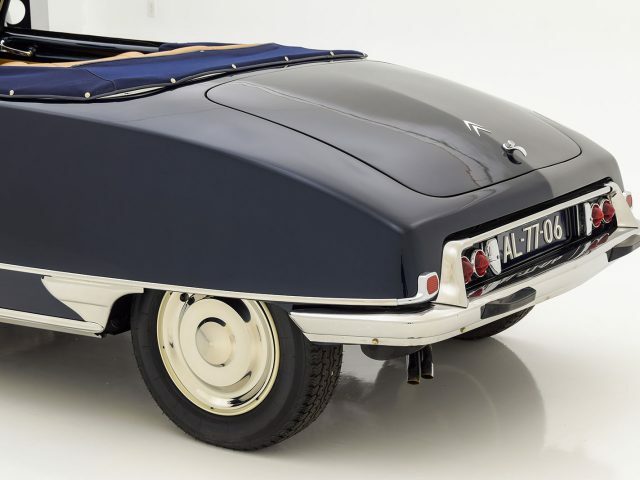 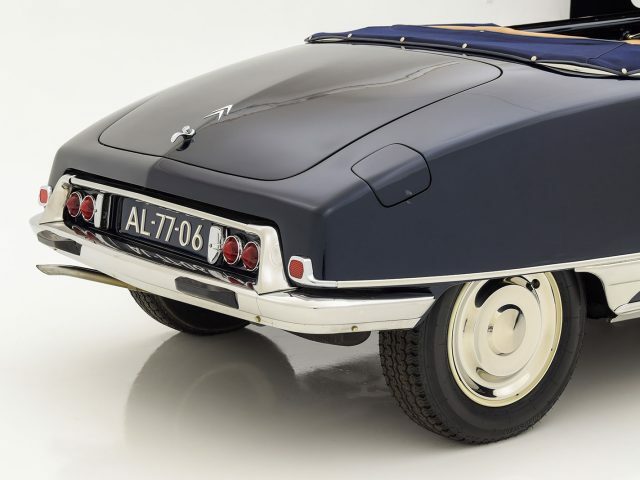 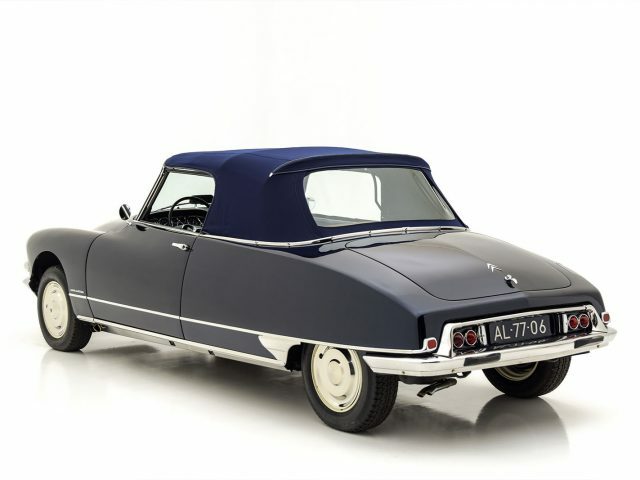 Select outside coachbuilders also embraced the DS, with none more prolific than the great Parisian firm Henri Chapron. 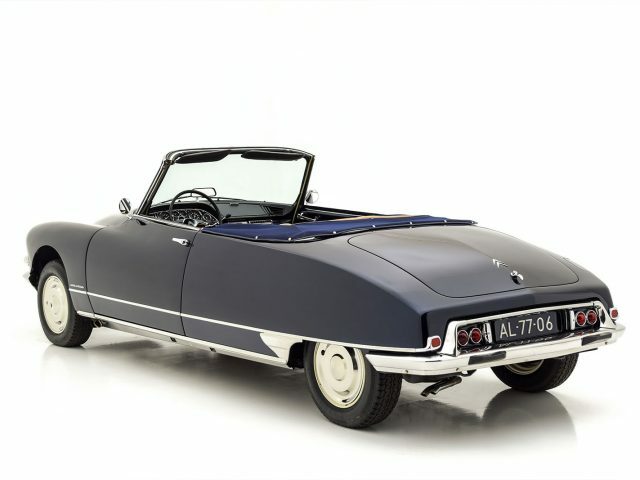 Limousines, coupes, and convertibles all came out of the Chapron shop, first as private conversions. 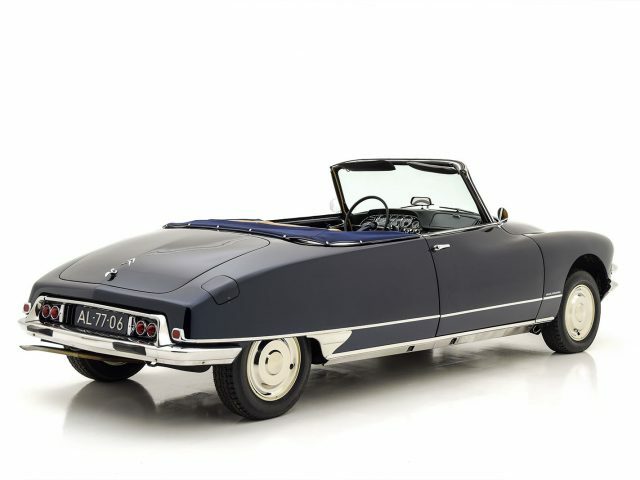 Citroen was so impressed with the conversion that they commissioned Chapron to produce an officially sanctioned cabriolet. 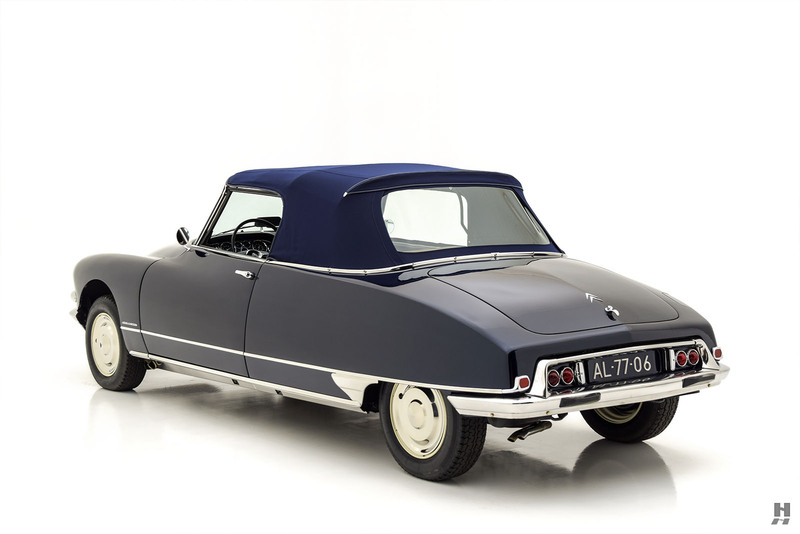 In order to turn a sedan into a cabriolet, Chapron substantially reworked car, reinforcing its platform for additional torsional rigidity. 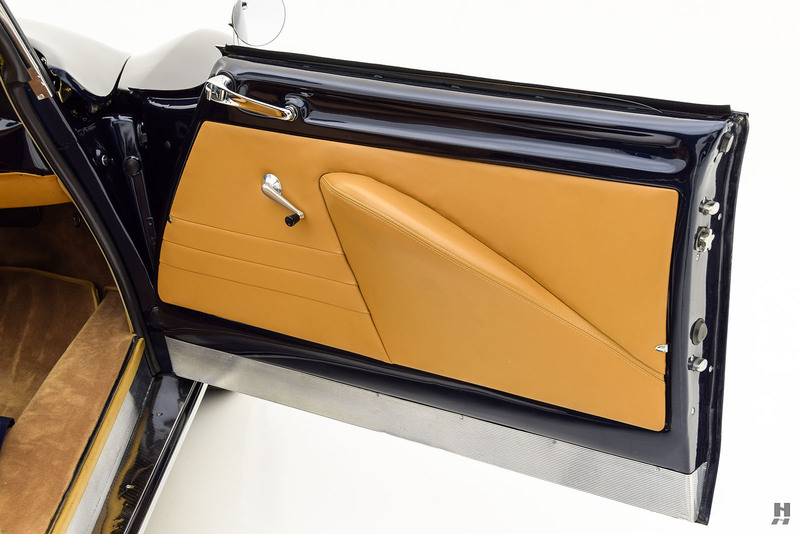 Every panel from the windscreen back was new for the so-called Décapotable. 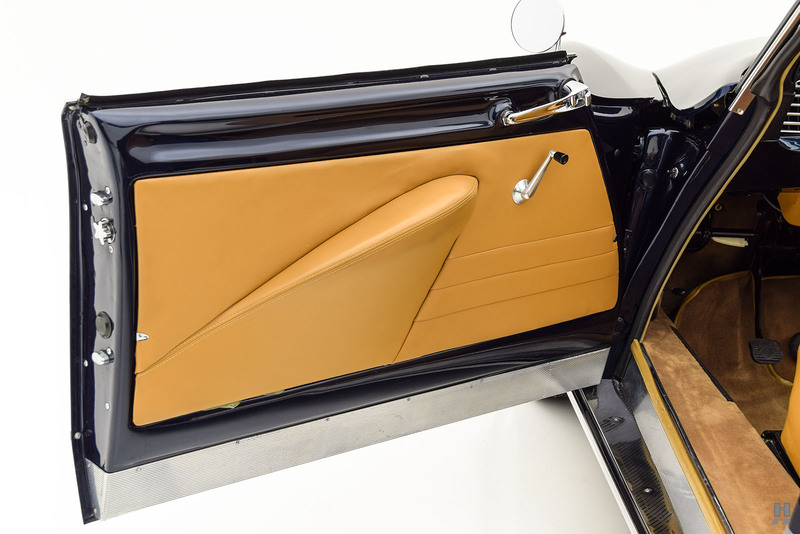 Chapron stretched the doors, built new quarters and bootlid, and revised the rear bumper to accommodate the turn signals which had to be moved from the standard location on the C-pillar. 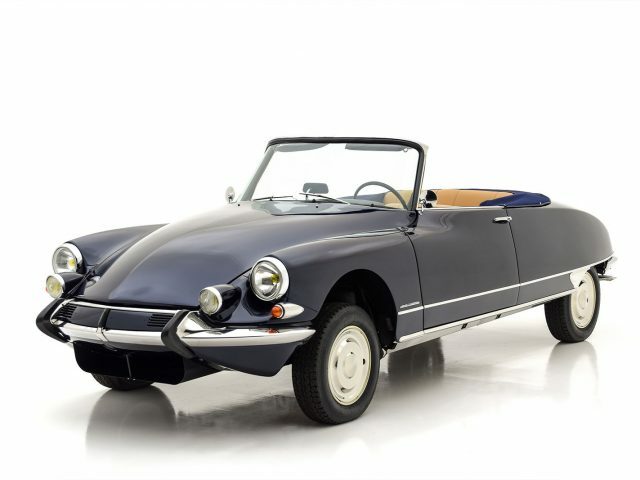 Thankfully, the conversion lost none of the DS’s drama. 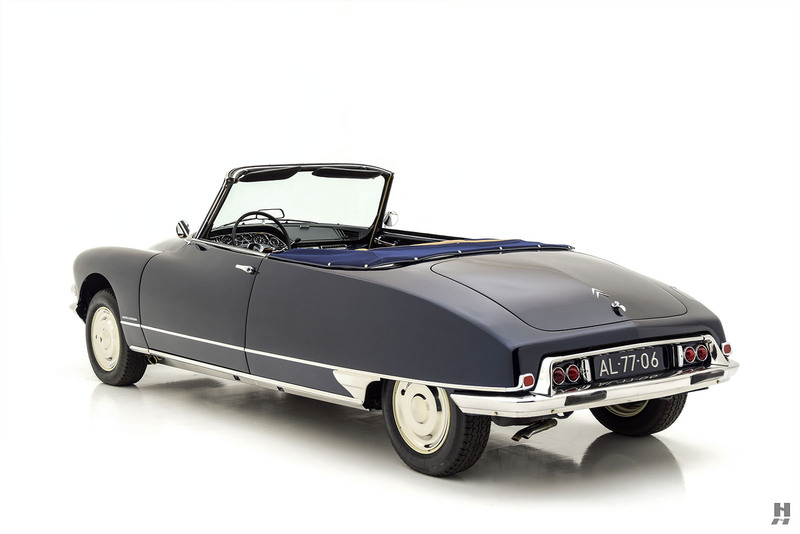 Hand-built in small numbers, the Chapron Décapotable is counted among the most exclusive and collectible variants of the DS, with exceptional examples coveted by collectors for their achingly beautiful lines as much as for their rarity. 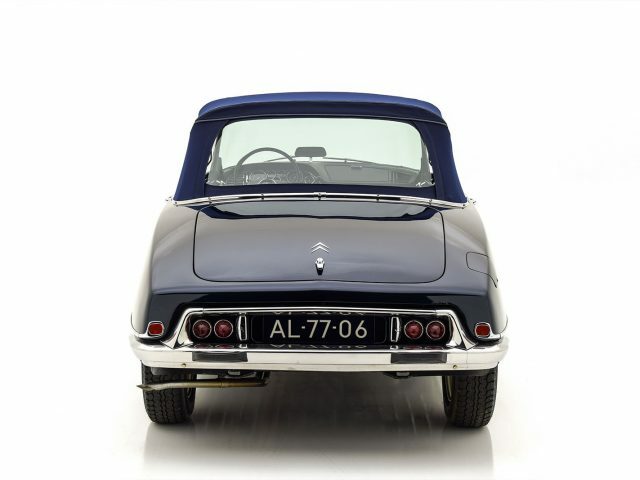 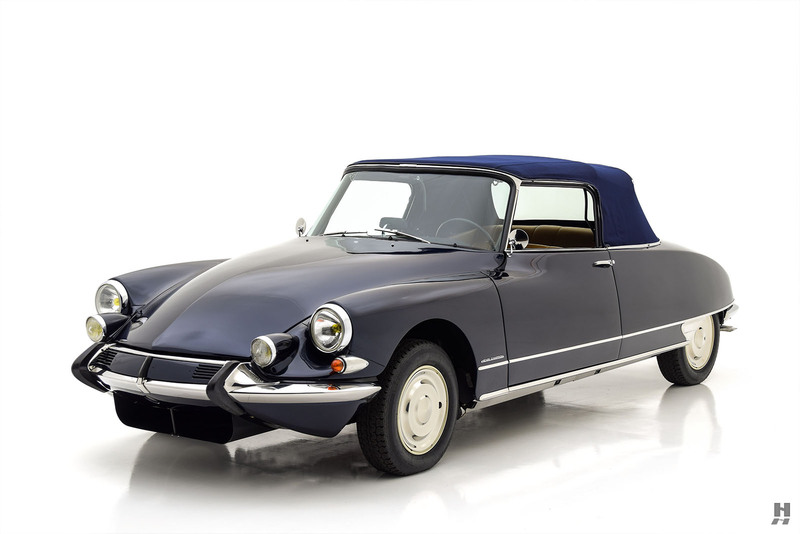 Beautifully restored and comprehensively upgraded, this 1964 Citroen DS19 Décapotable offers much more than initially meets the eye. 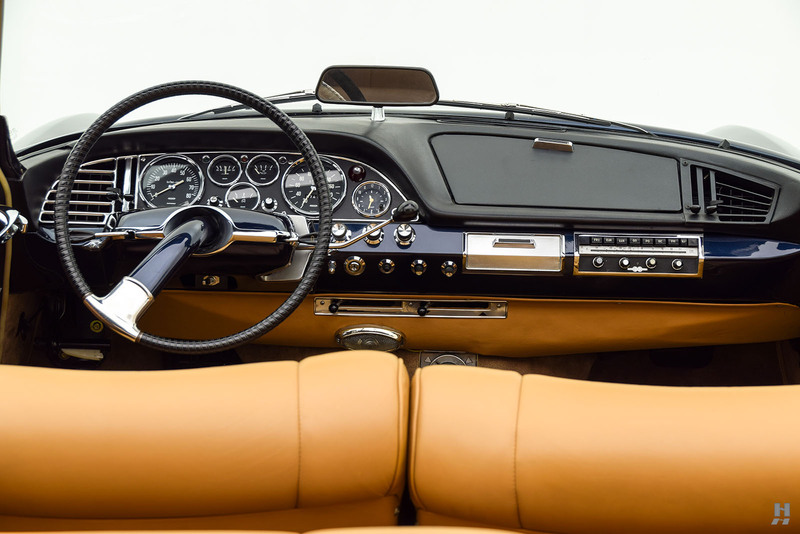 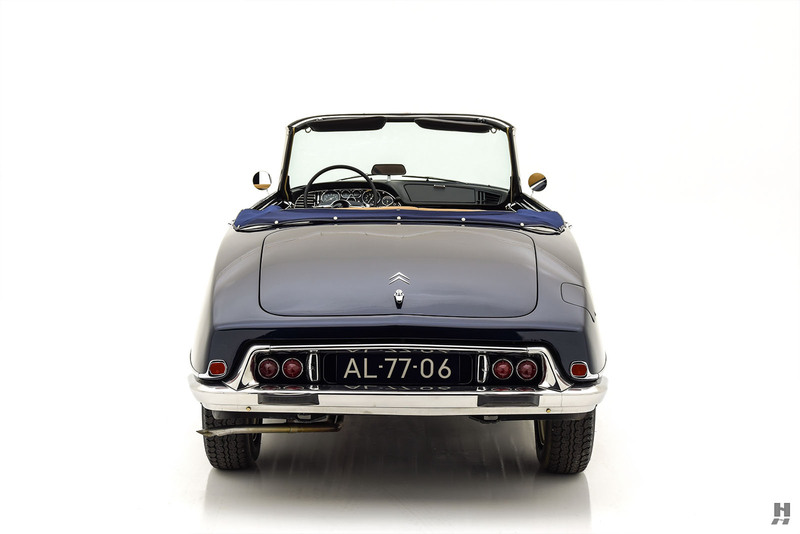 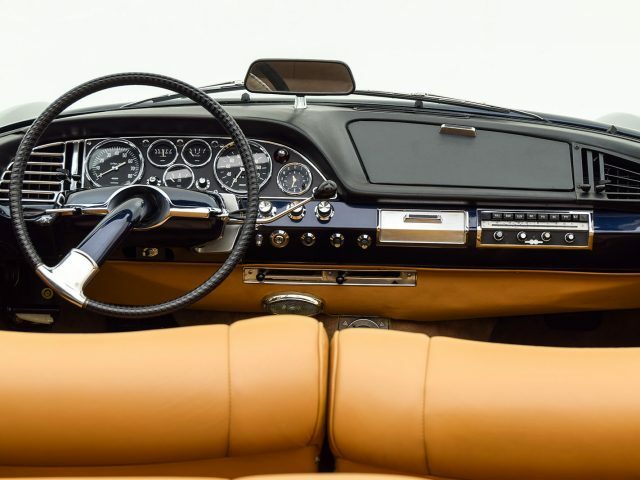 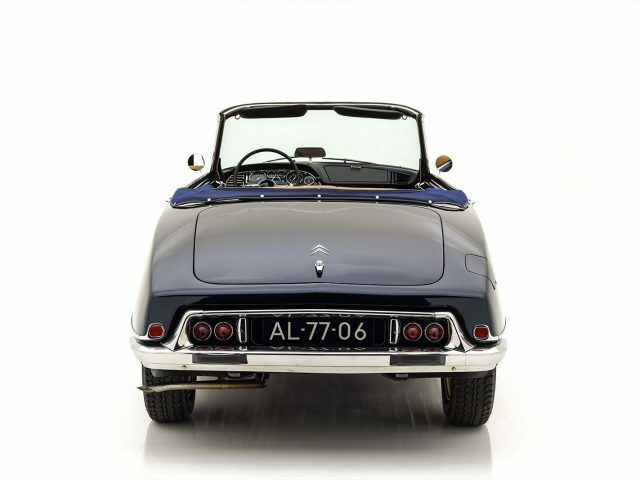 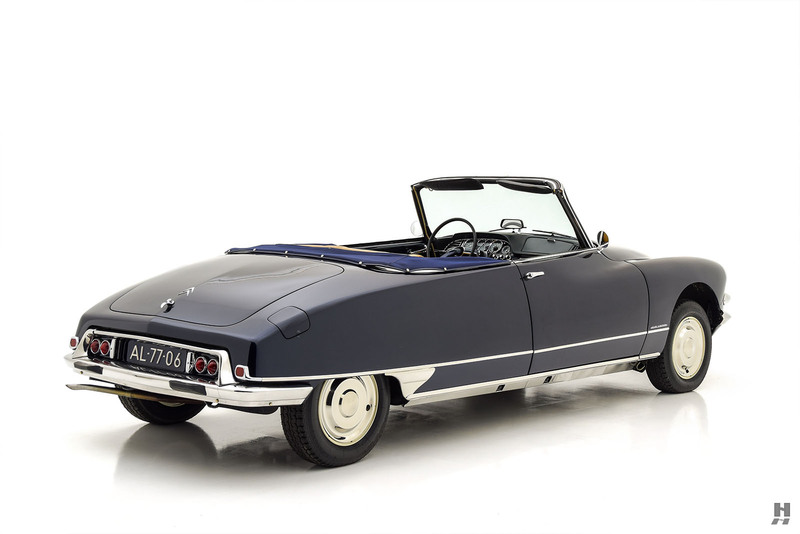 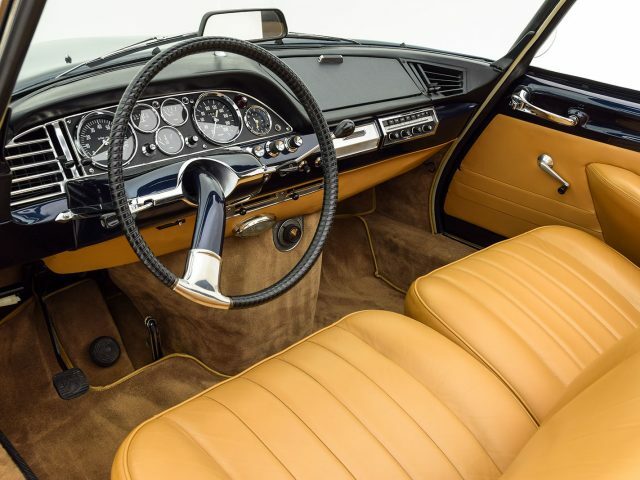 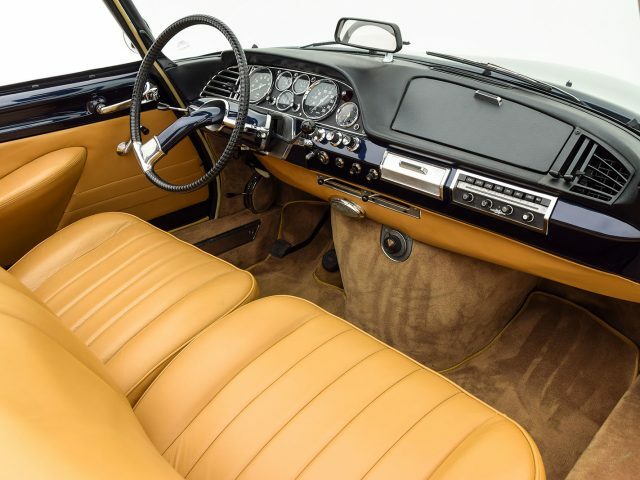 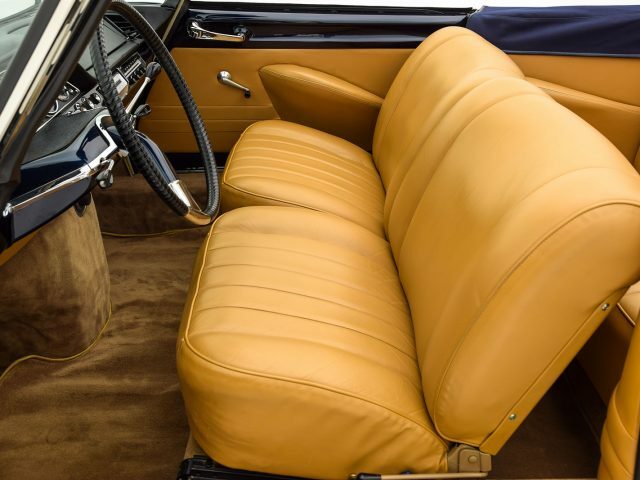 On the surface, this is an exquisitely restored and finely detailed DS Chapron, finished in a gorgeous shade of metallic indigo blue with a blue canvas roof and tan leather interior. 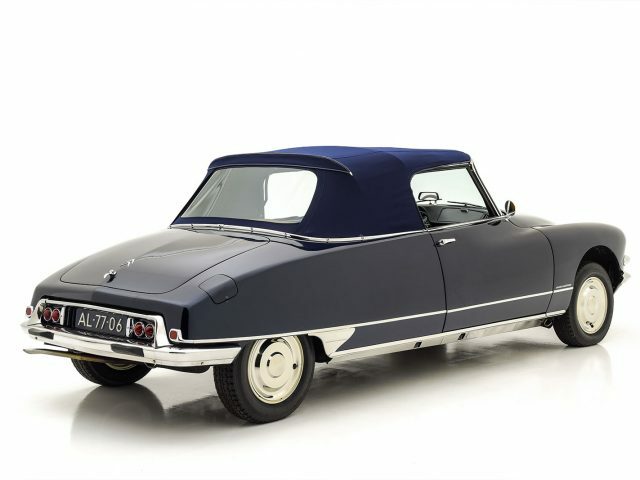 Lifting the bonnet, however, reveals a comprehensively built, turbocharged, fuel-injected 2.5-liter engine adapted from a later Citroen CX. 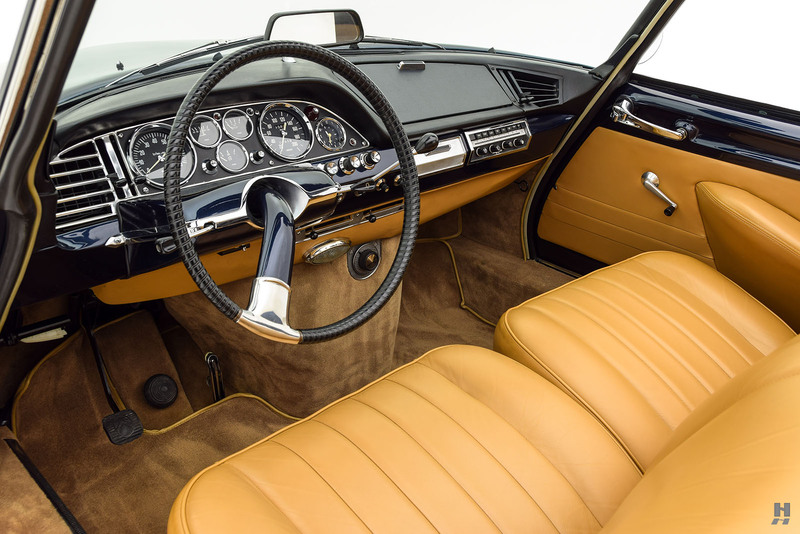 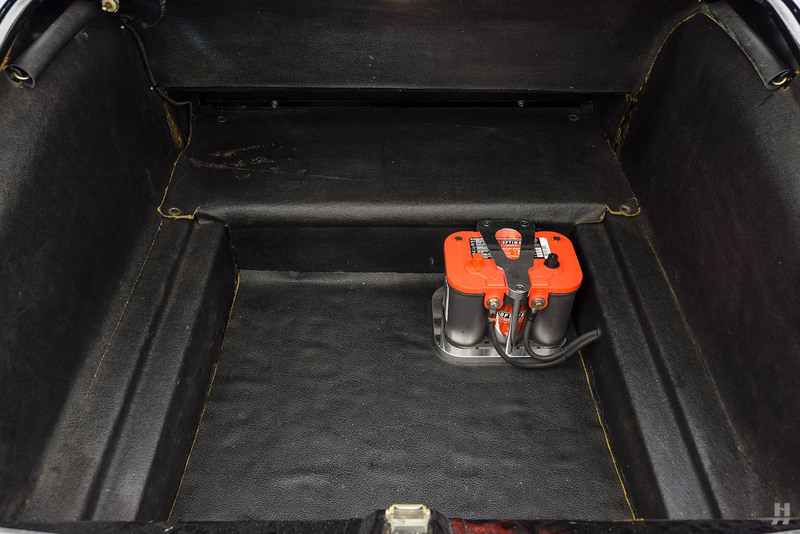 From top to bottom, the restoration and subsequent improvements are beautifully executed. 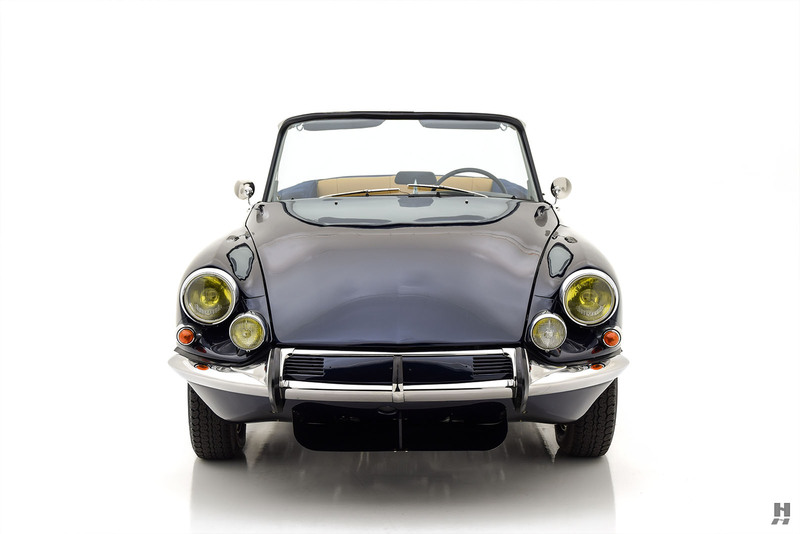 The initial restoration occurred around 2004, while the car was in Europe. 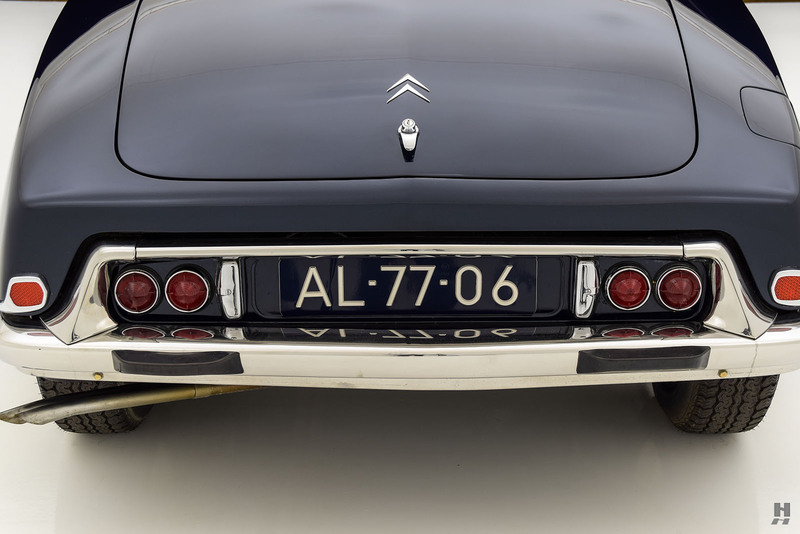 The project is documented with a series of photographs, and copies of ownership papers place the car in Holland in 2006. 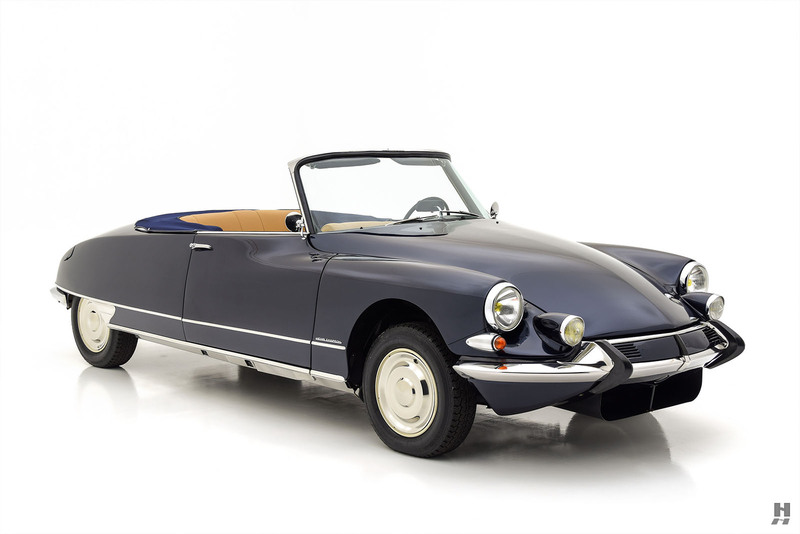 In 2011, the Citroen came to the United States courtesy of an enthusiastic new owner who immediately had it serviced and prepared for touring and rallies. 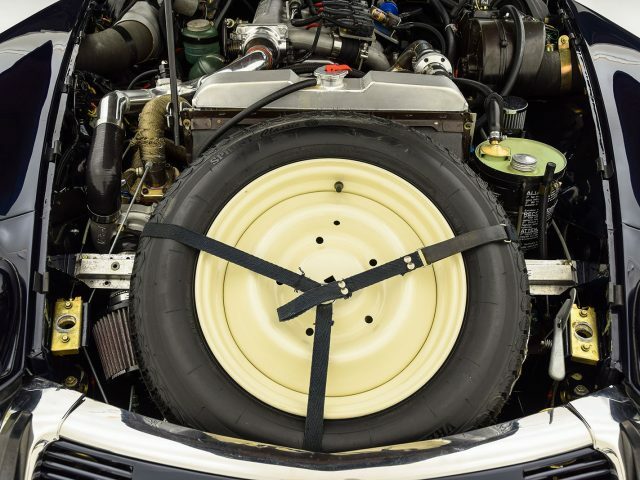 Around that time, it was decided to replace the original engine with something more powerful, while respecting the car’s rarity and importance. 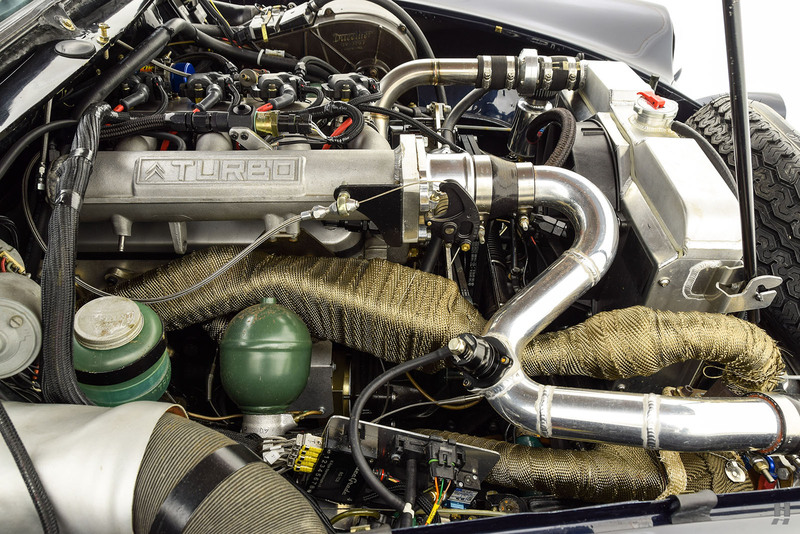 The owner then commissioned an Indiana-based prototyping/engineering firm to source, build and install a late-model CX GTi Turbo engine. 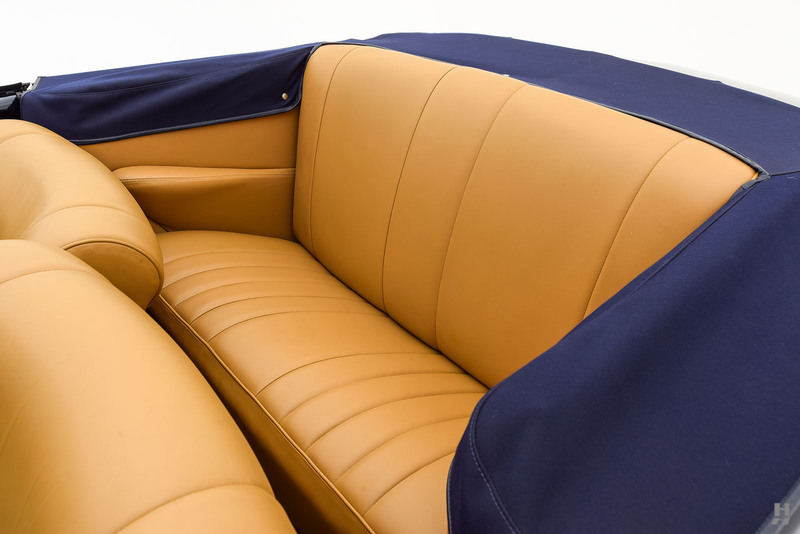 An impressive stack of invoices document the process, which took place from 2011-2013. 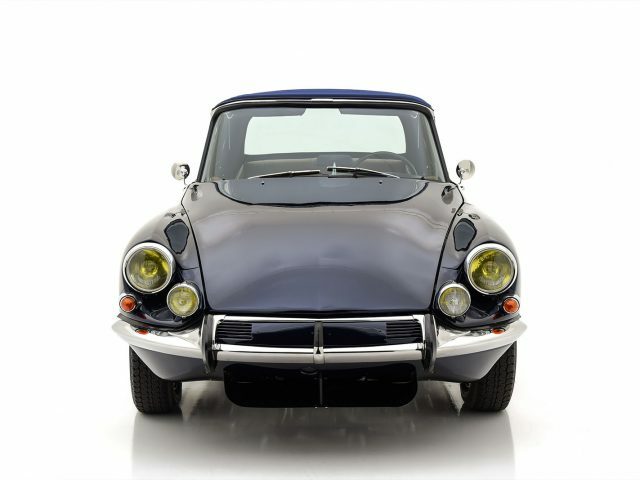 So much more than a simple engine swap, an incredible amount of re-engineering took place to adapt the transverse CX engine into the longitudinal DS platform and have it fit under the bonnet. 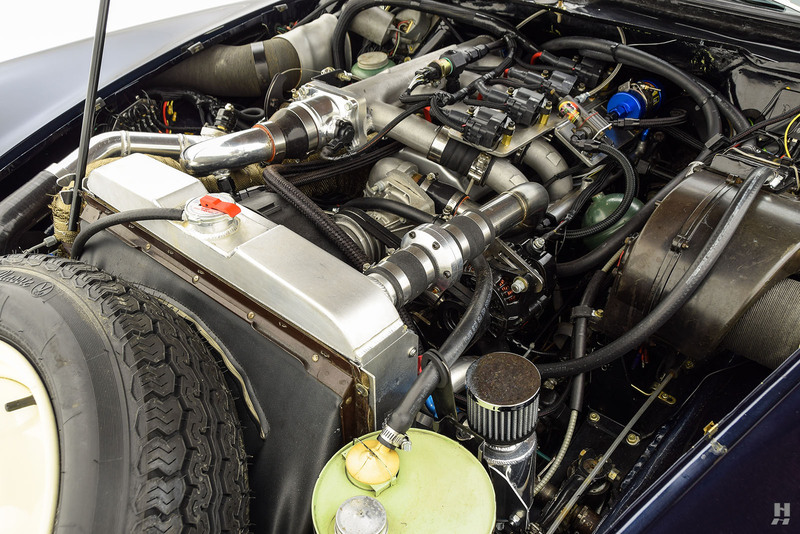 Before installation, the engine was rebuilt for additional power, refinement, and longevity. 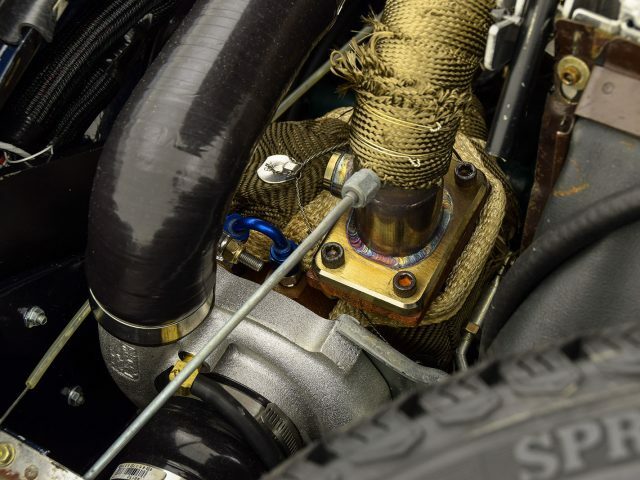 The 2.5-liter “stroker” crankshaft is micro polished, lightened and balanced, then paired with custom billet pistons and balanced connecting rods. 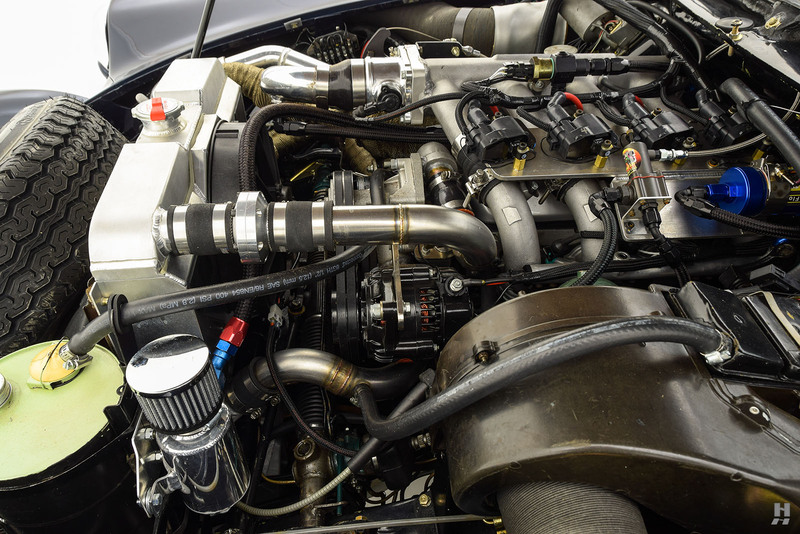 Additional features include a ported-polished head with stainless valves, a specially designed cam, custom CNC-milled flywheel, and an updated turbo. 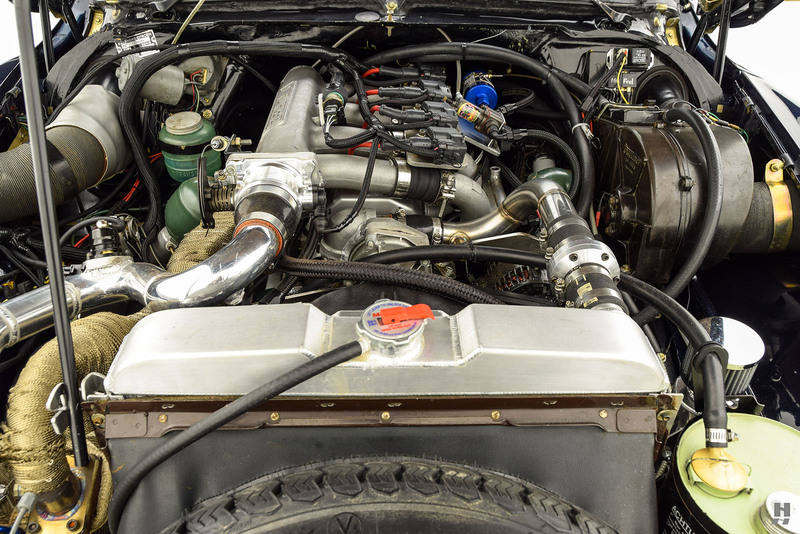 Fueling and ignition are controlled via a standalone Motec M400 ECU, custom adapted with a hall-effect distributor, crank and cam sensors. 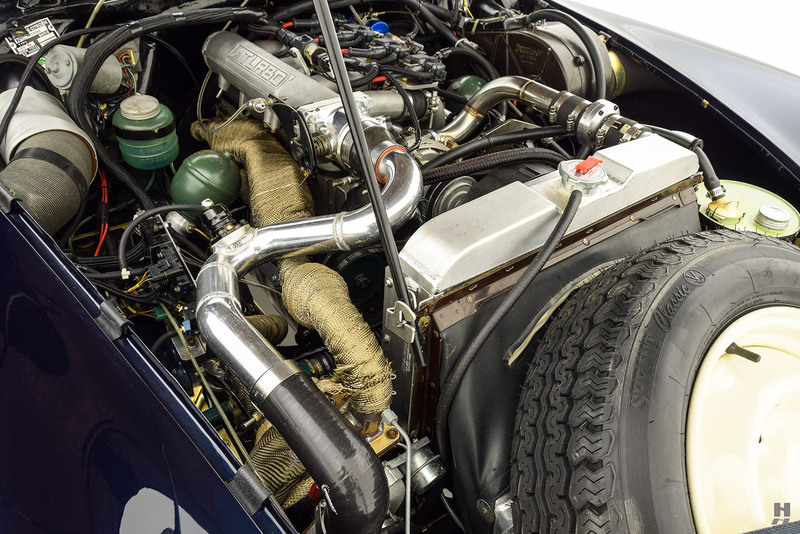 A custom alloy radiator by Ron Davis keeps things cool, and the 5-speed gearbox has been suitably upgraded with gears made by Hewland. 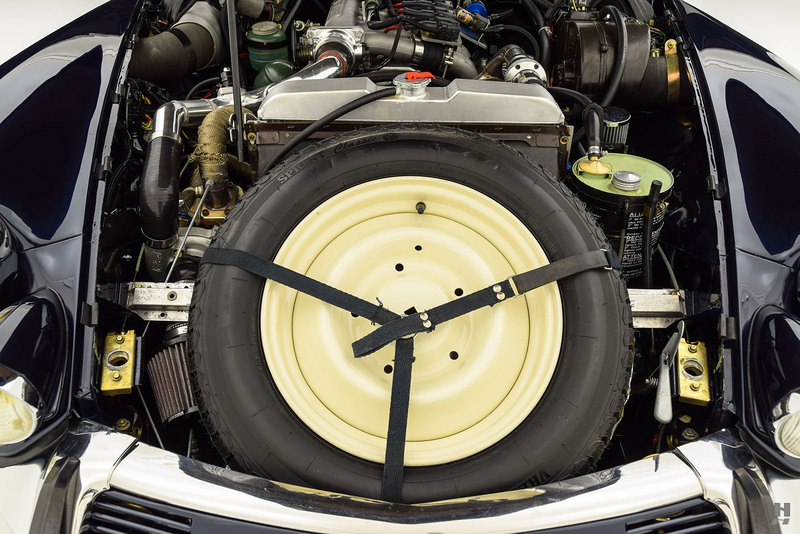 Countless other details ensure a seamless installation that, when the bonnet is closed, allows the car to be virtually indistinguishable from a standard model. 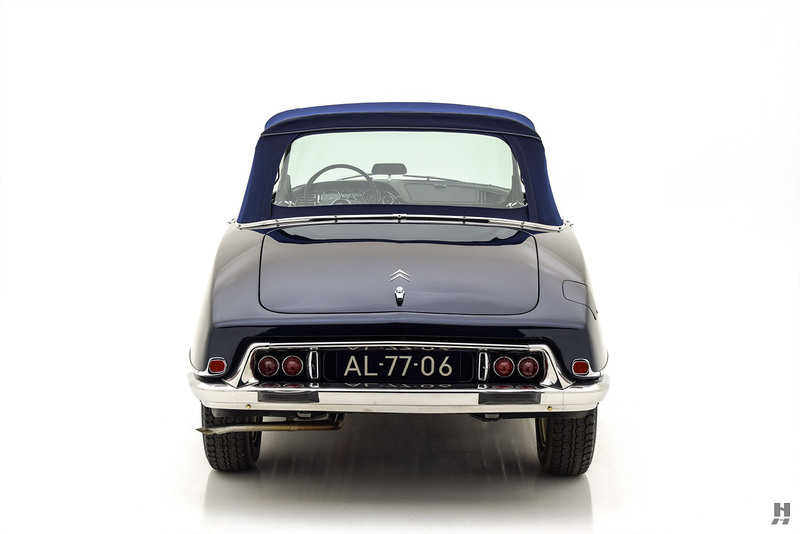 Resplendent in the gorgeous shade of blue, the body and paintwork are outstanding, with straight panels and excellent brightwork. 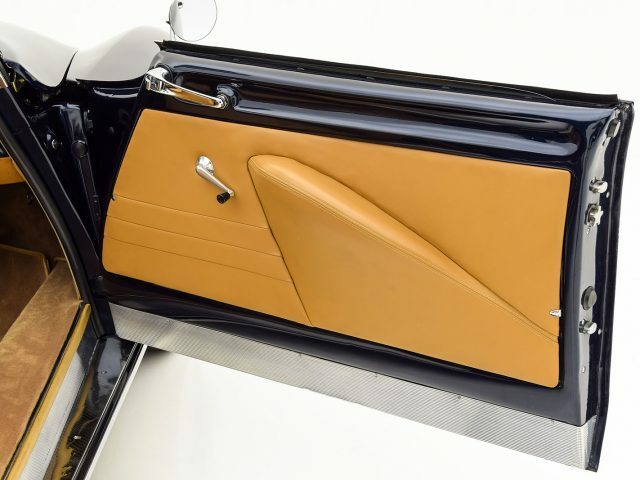 Panel fit is precise and consistent, and the detailing is exceptional. 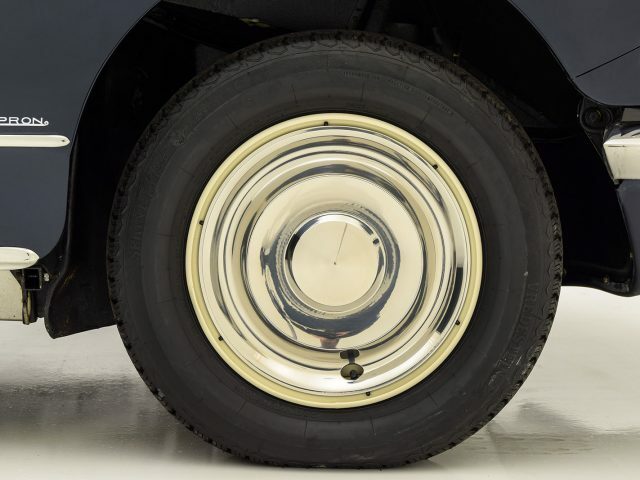 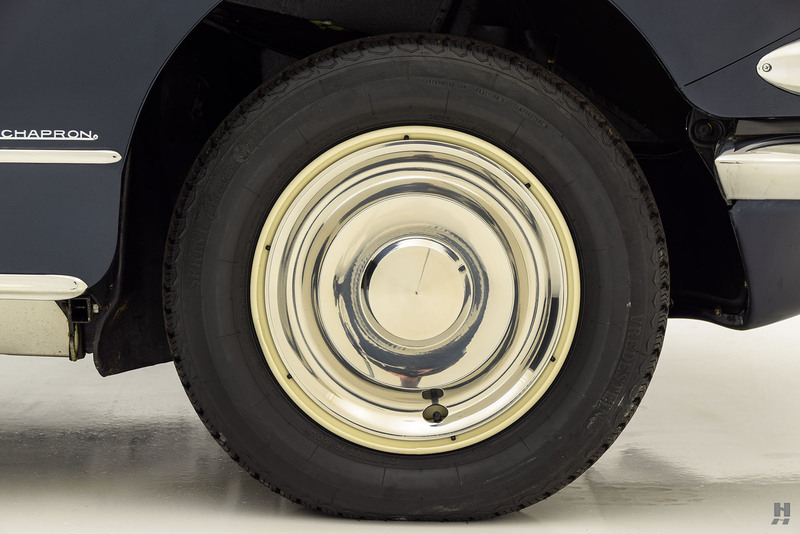 It rides on factory steel wheels, finished in cream as original and adorned with full stainless steel wheel covers. 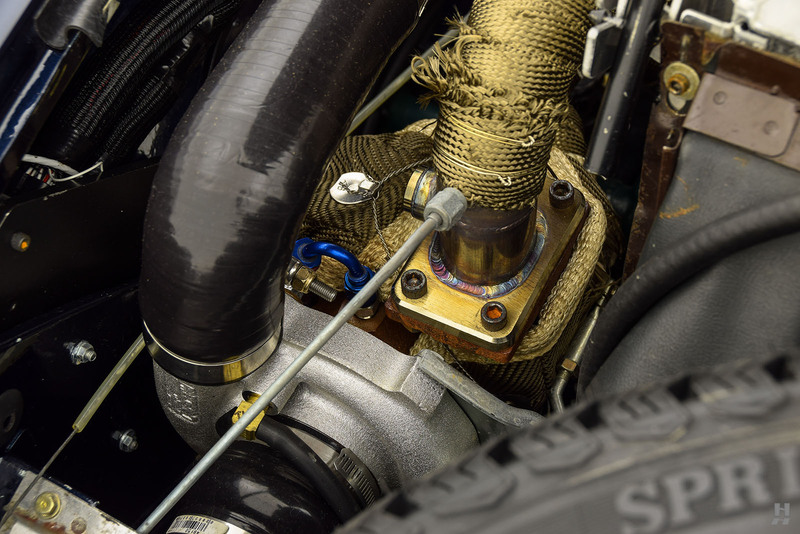 Vredestein Sprint Classic radials provide ample grip to handle the additional output of the new engine. 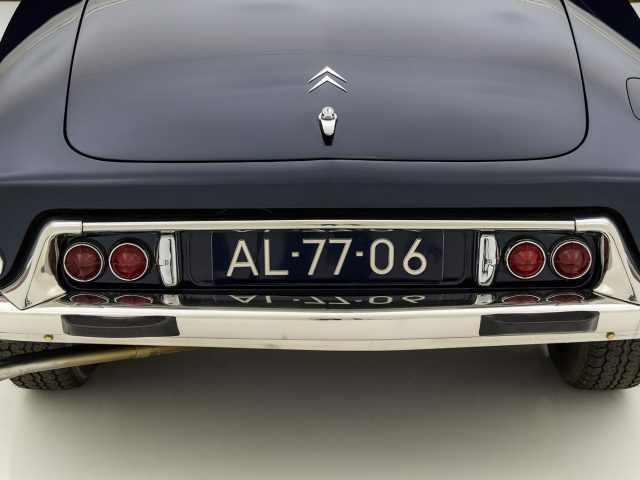 Lighting consists of lovely Cibie headlamps and S.E.V. 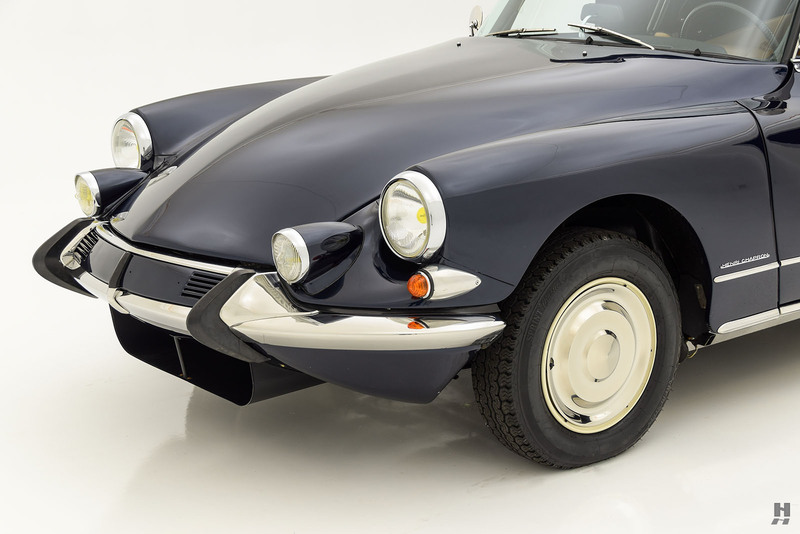 Marchal fog light pods, specifically designed for the DS. 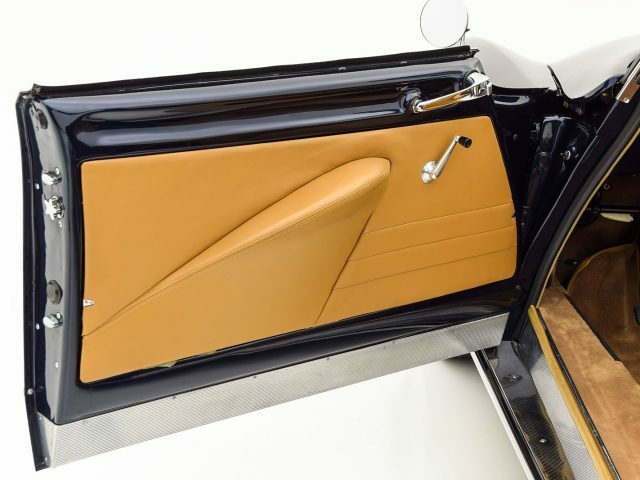 The interior is beautifully restored using the highest-quality materials. 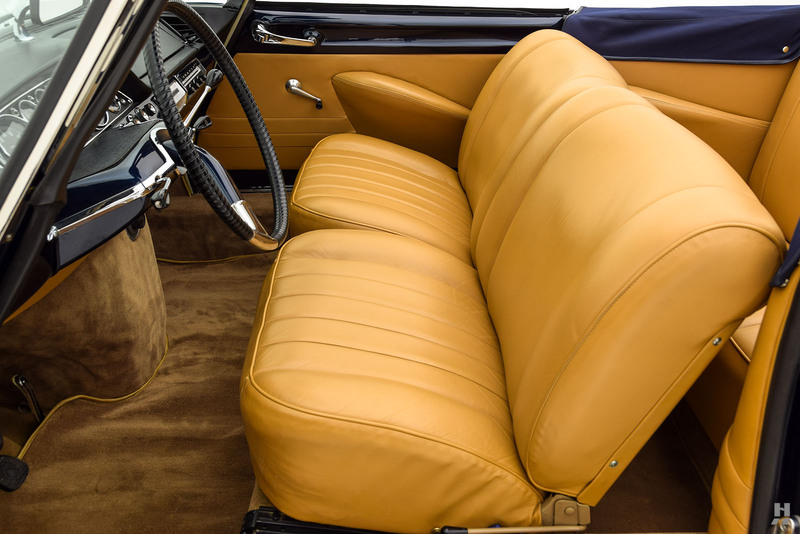 The tan leather seats remain supple, with only the slightest signs of creasing beginning to show in the driver’s seat. 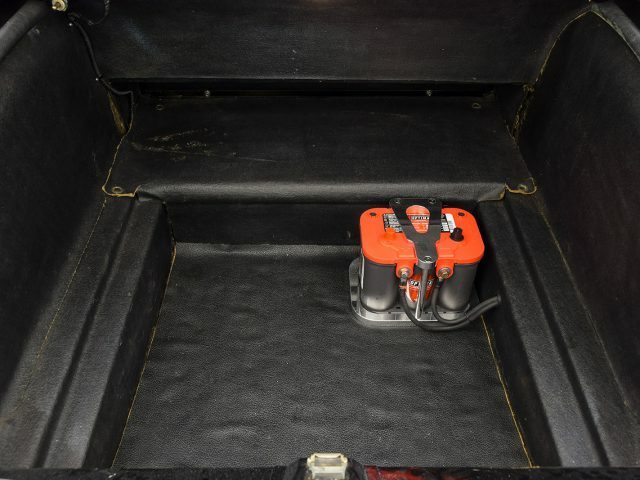 Luxurious carpets and other trimmings are fitted with care and precision. 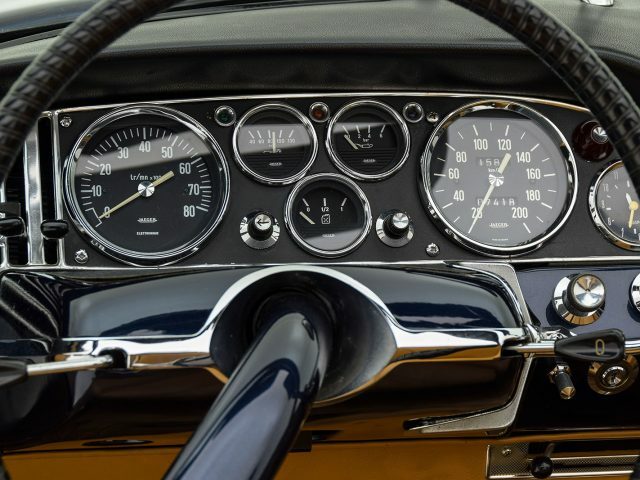 Appointments include the optional Jaeger round-dial instrument panel as well as a restored factory radio. 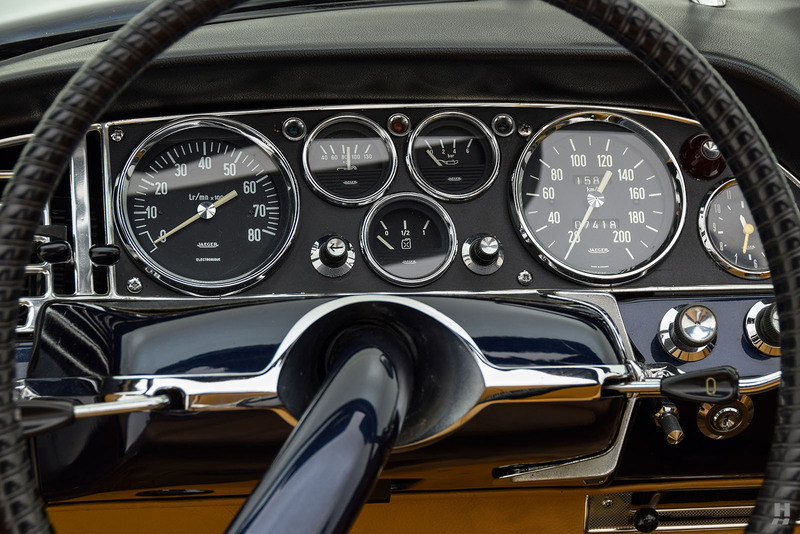 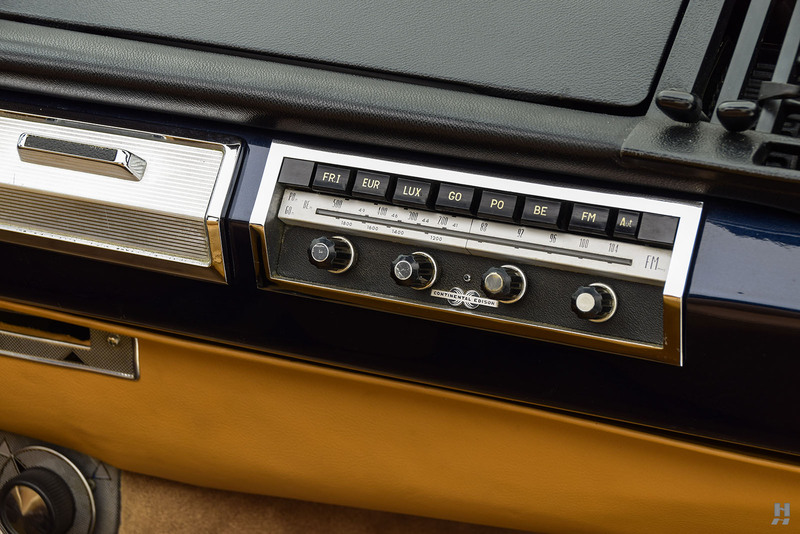 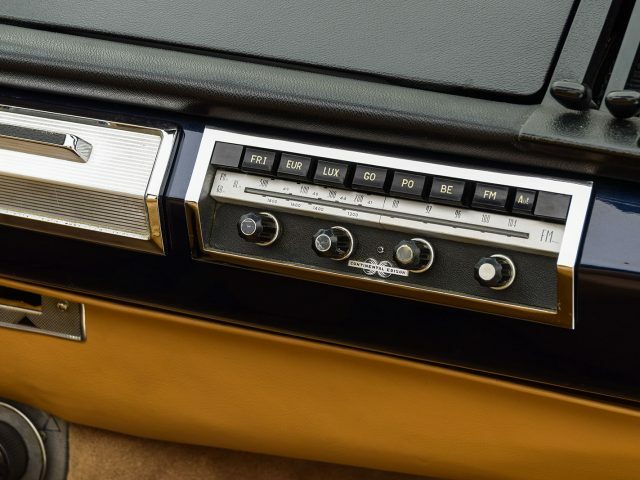 Switches, controls, and knobs have all been fully restored, making the dash just as beautiful as the rest of the car. 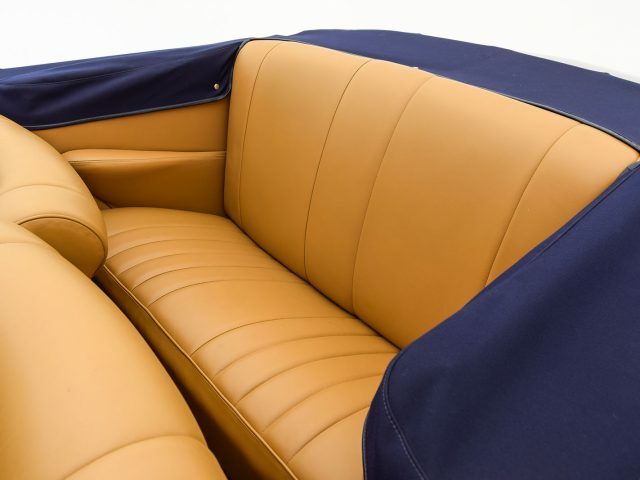 The blue canvas soft-top fits snugly, is fully lined, and ties the color scheme together beautifully. 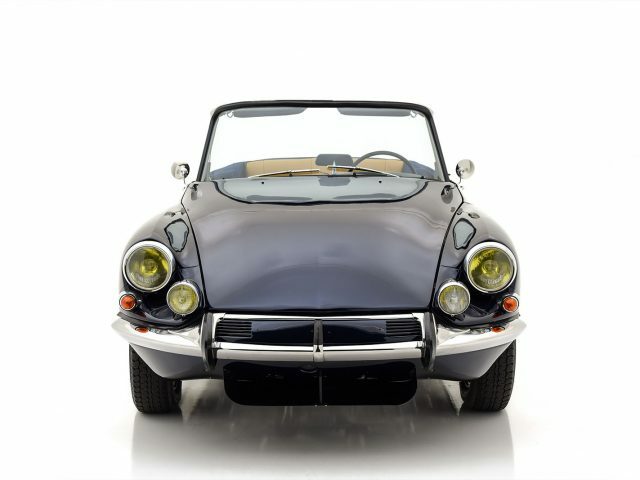 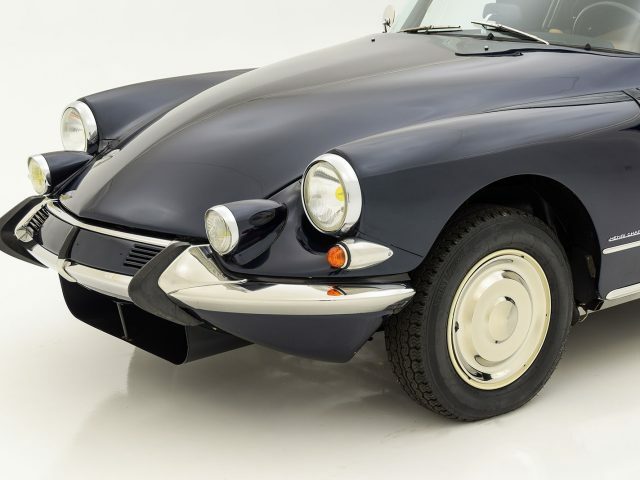 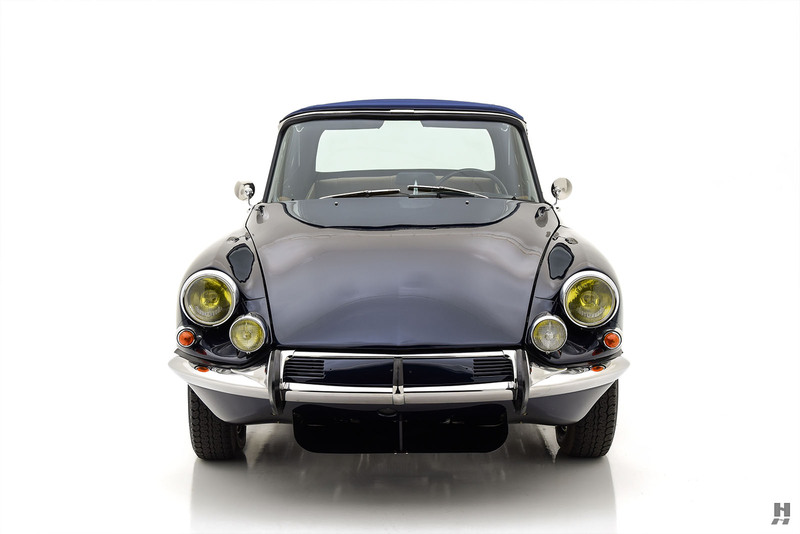 Great care was taken to ensure this DS operates as it should, including the hydraulics, which are converted to use the widely available LHM fluid. 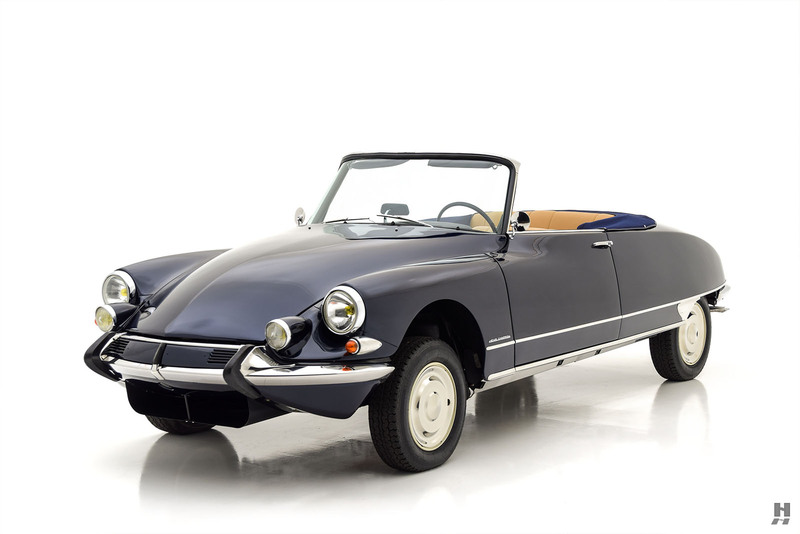 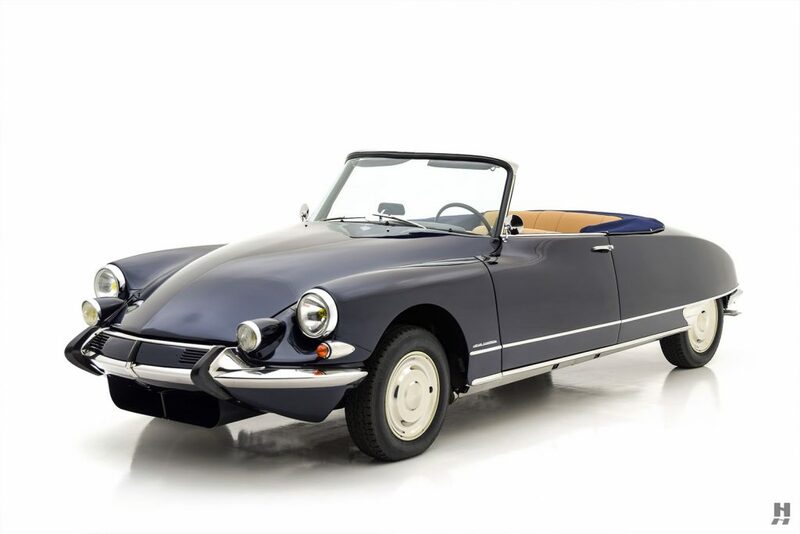 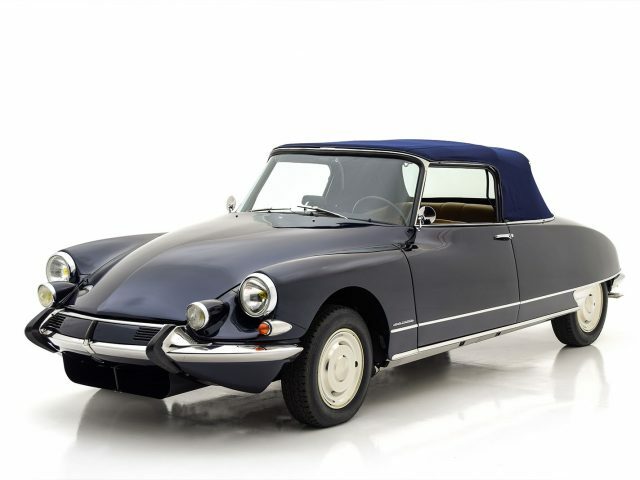 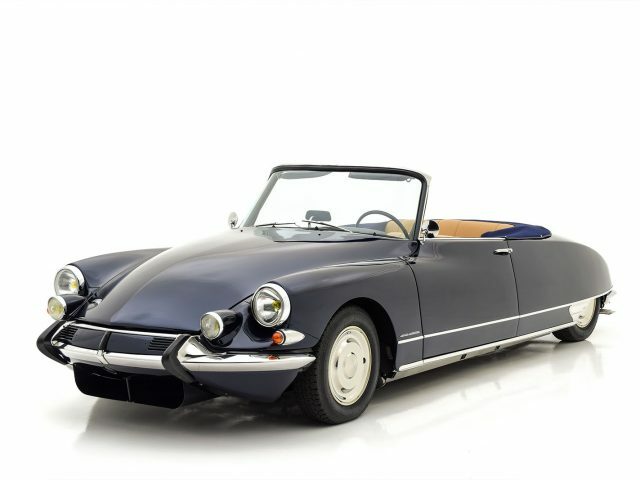 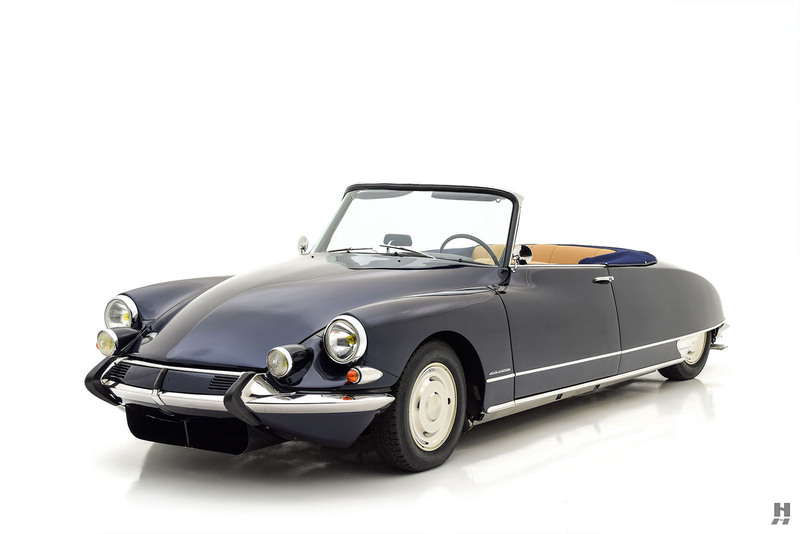 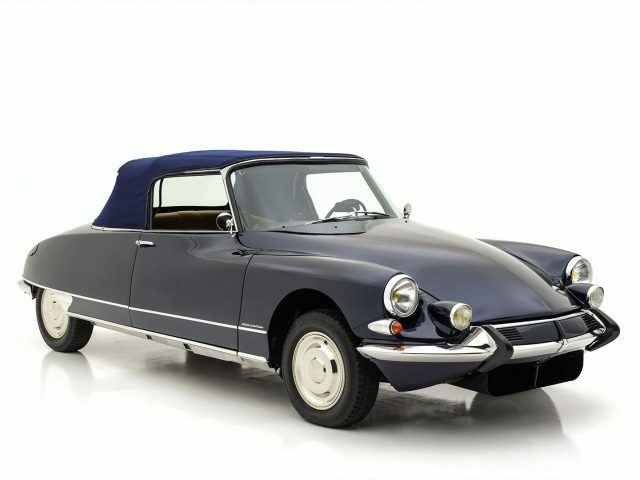 In essence, this is a concours-restored DS Chapron, thoughtfully and meticulously updated for use in modern conditions. 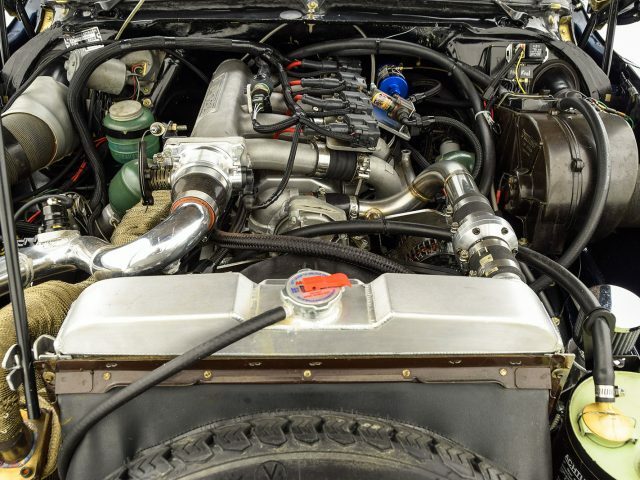 The sale includes the original 1.9-liter engine, gearbox, and most of the parts removed during the conversion. 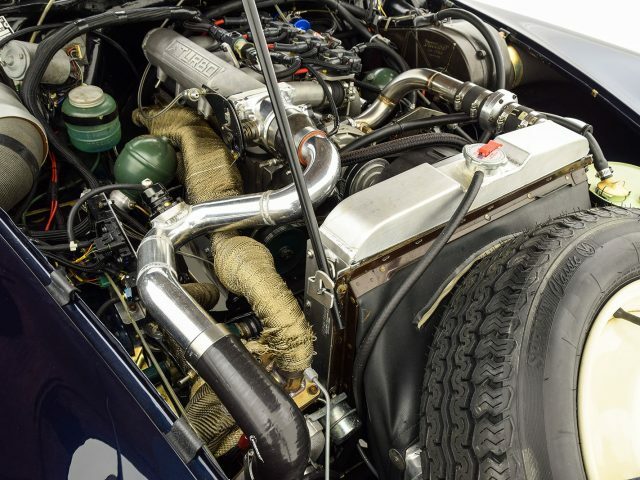 Also included is an extensive history file with restoration photos and invoices for the service and engine conversion totaling nearly $200,000. 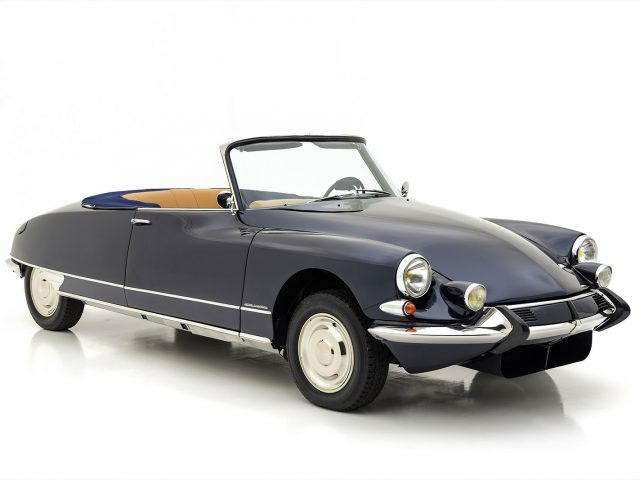 As one of just 184 Chapron Décapotable models built in 1964, this car is indeed very rare and highly collectible. 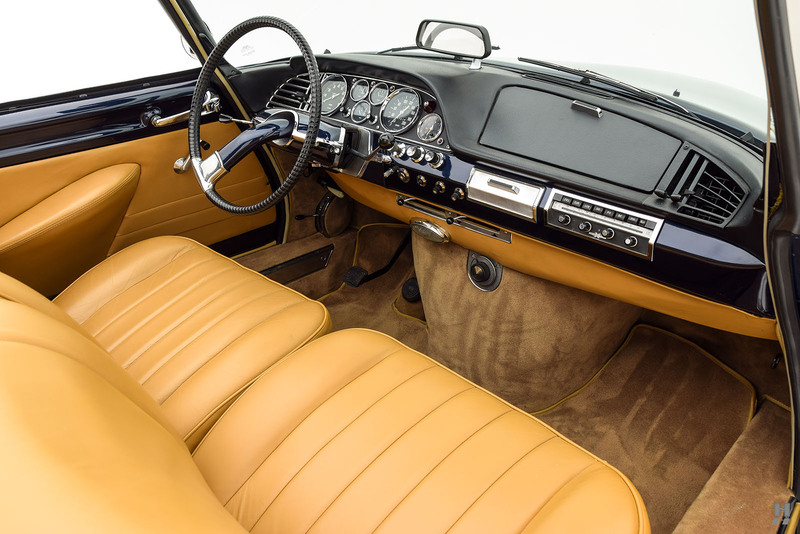 Without a doubt, this is one of the finest examples we have encountered, and the extensive upgrades ensure it is an absolute joy to drive. 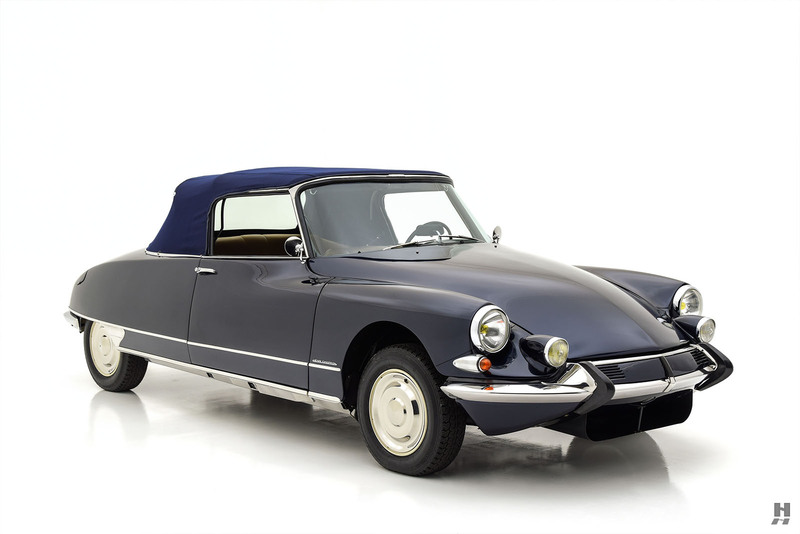 The elegant presentation is sure to please the purists, and with at least double the original output, this gorgeous Chapron is certain to thrill its next keeper.